What beautiful colours!! How long would it take you to spin that amount of yarn! Aren’t they? Three Waters Farm does amazing things with color! The time it takes really depends on so much. In a ‘normal’ kind of schedule for me I would say a week if I’m focused on it. If, like right now, I’m splitting time between this spin, a spindle spin and knitting a sweater I’m really enthusiastic about, then we’re looking at more like 2-3 weeks. If, however, I find myself with a slow week at home, I could finish in 2 or 3 days. Lot o’ variables! Well, the current spin isn’t for a sweater — it’ll more likely be more in the shawl yardage area. 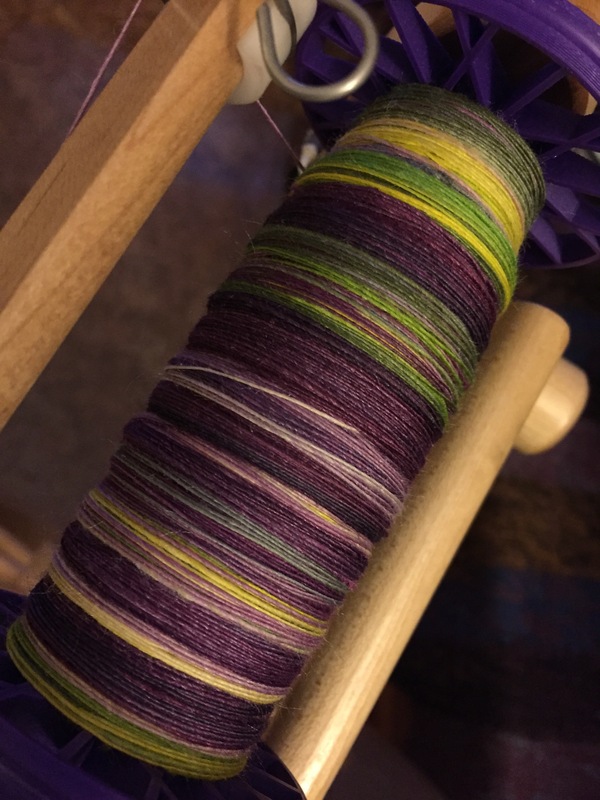 From spinning to sweater takes me more like 6-months to a year start to finish if I’m (mostly) focused. I love those colors – they remind me of African Violets! Right?! Or “Black Pansies?” That’s the name of the colorway! Aaaahhhhh – black pansies! I see that now too!